Heads-up, fellow males. Valentine’s Day is rushing up on us. It’ll be here before you know it. Can we agree not to screw it up this time? Can we agree not to wait until the very last minute? Can we agree not to grab a random box of chocolates at your local Food World or order an overpriced fistful of generic flowers online? Yeah, guys, I know that procrastination is our natural instinct. We are guys, after all. Why do something now if you can do it later? For the sake of your sweetheart, though, please read these tips on how to order flowers for Valentine’s Day. We’re hooking you up with sage advice from experienced florists. Collectively, lovestruck human beings are about to drop nearly $2 billion on flowers, so here are steps you can take to get your money’s worth. Order as soon as possible. Flower prices peak in February — especially for red roses, that Valentine’s Day staple. The longer you wait, the more expensive it gets. Not only that, but consider having your flowers delivered a day early. Valentine’s Day, Feb. 14, falls on a Tuesday this year. Florists will be scrambling to deliver nearly all their Valentine’s orders on that one day. “A lot of florists offer incentives if you have it delivered early. And if you do it a day earlier, she’ll have the bouquet all day Valentine’s Day to enjoy,” says Dirk Lorenz, the owner of Fremont Flowers in the San Francisco area. Go with a local florist, not one of the big florist networks. Sure, those big conglomerates are convenient. But if you go through them, you’re just paying a middleman, and you won’t get the best value. Look for a reputable florist near you who delivers. You’ll pay less for more, and you’re more likely to get the best quality flowers. “When you order through a call center, they are not the people doing the work. 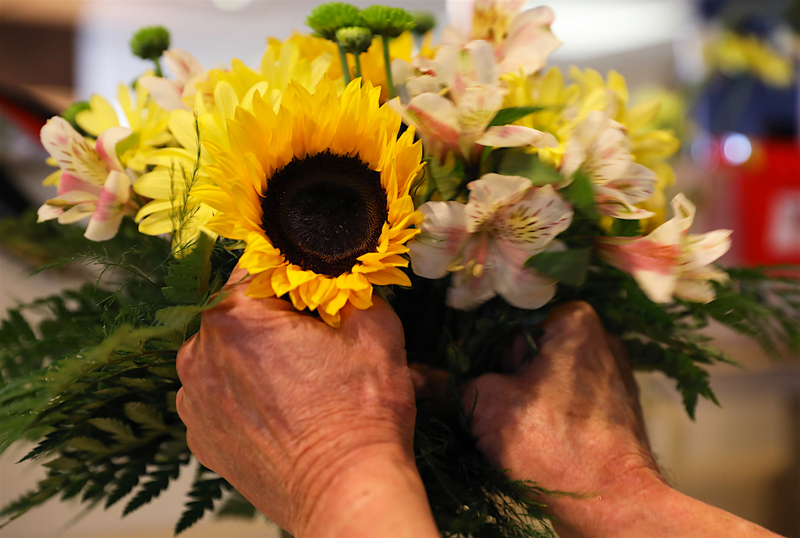 They’re taking a large service charge and farming the work out to someone who’s agreed to take the order for a lesser amount of money,” says Robin Heller, president of the Retail Florists Alliance and co-owner of Flowers by David in the Philadelphia area. Normally we’d say let Google be your guide, but be careful in this case. If you type (your city) and “flowers” into the search bar, the top results will sometimes be remotely located outfits that buy up local florist domain names. They’re not really local. Local florists complain that these fake local websites can be less than reputable. You should pick an actual brick-and-mortar establishment located near you. A better option: The Society of American Florists maintains a useful national florist directory online. Type in your ZIP code, and it’ll show you links to local florists’ websites. Yelp is a good place to check out customers’ reviews of florists in your immediate area. Most florists have websites where you can browse through bouquets based on category and price range. That’s a good place to start, but these sites can all start to look alike because so many florists have web pages built from the same templates. Sure, you can order online. It’s 2017, man. Just point, click and you’re done, right? Or you could do something super crazy and out of the box and pick up the phone and speak to a human being. This is an especially useful strategy if you’re on a tight budget. “Florists work with all budgets. You can just tell them, ‘This is how much I have to spend. I’d like it to look as good as possible.’ They can be very creative with smaller arrangements,” Hendrick said. You can also brainstorm about what style or color of flower arrangement your wife/girlfriend/significant other/snuggle bunny might like. Is she funny, serious, bold, shy, delicate, romantic, outdoorsy, outgoing? “If this is a new relationship — somebody you’ve been dating for four weeks — what the florist recommends will be a lot different than for a husband getting flowers for his wife of 20 years,” Hendrick said. You can’t really go wrong with a dozen long-stemmed red roses. But if you’re on a budget, you should know that red roses are way overpriced this time of year. Due to supply and demand, florists are paying twice as much as usual for them. Instead, you might consider tulips, calla lilies, hydrangeas, gardenias, hyacinths or alstroemerias. Whatever looks good to your eye. The price of roses goes up $2 per bloom around Valentine’s Day, said Alan Rulifson, head floral designer for Green Bench Flowers in the Tampa Bay area. For an alternative, he suggests tulips, which are in season in February. At his shop, 15 arranged tulips cost $35, while 12 roses cost $80. Now, your mileage may vary here. You’ll save money on delivery fees if you’re willing to pick up the flowers yourself. You could present them to your sweetheart when you pick her up for a Valentine’s Day dinner date. But florists generally recommend sending them to her workplace. Yes, your local grocery store will probably have flowers in stock. Yes, they can be cheaper than the floral arrangements at a florist’s shop. But this strategy can be a bit hit-or-miss for Valentine’s Day. If you’re planning to rely on a grocery store, call ahead and ask what time its flowers usually get delivered. That way, you’re more likely to get first pick and not come up empty-handed. You’ll have a tough time making those flowers look as good as a florist would. At least take them out of the ugly plastic wrapper, and wrap them in colored tissue paper and ribbon or something. Finally: Don’t be intimidated by any of this. There’s really no way to do the wrong thing here, because it really is the thought that counts. You’ll get extra credit for the simple act of buying her flowers. Your Turn: Are you going to say it with flowers — or some other way? Mike Brassfield ([email protected]) is a senior writer at The Penny Hoarder. His wife likes flowers.